The Nechung Oracle, Lobsang Jigme, seated on a chair in the garden of Dekyi Lingka part of which may be seen in the background. 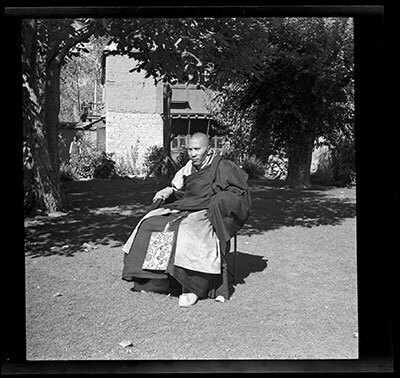 He is wearing monks robes with the long silk brocade coat underneath worn by high-ranking monks. The Tibet Album. "Nechung Oracle, Lobsang Jigme at Dekyi Lingka" 05 Dec. 2006. The Pitt Rivers Museum. <http://tibet.prm.ox.ac.uk/photo_2001.59.7.3.1.html>.